Isaac ‘Mr Ike’ Edwards Jr, died Wednesday at Heritage Manor nursing home in Houma, where he lived since Hurricane Katrina destroyed his New Orleans home. 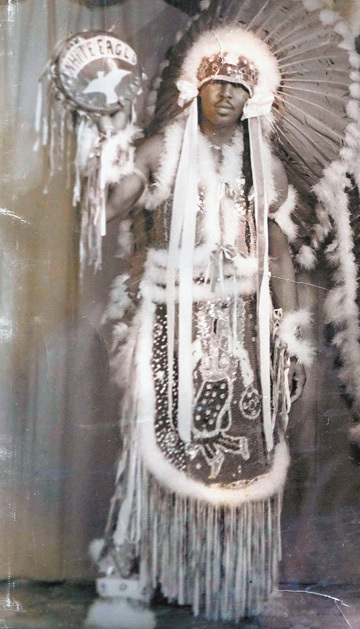 Edwards was the last link to an earlier time in Mardi Gras Indian history. Back then, Indians had to save every penny and nickel to assemble their suits, dying discarded turkey feathers and salvaging beads off old ball gowns. After earning early awards from New Orleans own Mardi Gras Indian Hall of Fame, Edward continued to earn praise for his artwork. A few years ago, Edward and Herreast Harrison, Cherice Harrison-Nelson’s mother (a close friend of Edward), received a commission from the National Civil Rights Museum in Memphis, Tennessee to create a butterfly apron that became part of the Museum’s permanent collection. Edward was lucid right until he passed, and one point he made regularly was the Indian culture he grew up with was not violent. This flies in the face of conventional Mardi Gras Indian history, according the late Larry Bannock, Big Chief of the Golden Star Hunters, I’m gonna mask that morning if it costs me my life. That morning you pray and ask God to watch over you, cause everybody is bucking for number one. After joining the Army Air Corps and the 92nd Infantry Division during the WWII, Edward started working as a longshoreman, which he kept for 38 years. He retired from costuming in 1952. However, after befriending Harrison-Nelson, the daughter of his long time friend Big Chief Donald Harrison Sr, he started sewing once more After being invited by Roselyn Smith, the principal of Oretha Castle Haley Elementary School and Harrison-Nelson, Edward started teaching the Indian traditions to a younger generation and helping to make butterfly patches and suits for the Young Guardian of the Flame. Working with students rejuvenated Edward. I want to be remembered as a great man who loved children, he said. Up until a month before his demise, Edwards continued to sew, still able to thread a needle without the aid of glasses in spite of his advanced age. Last month during his hospitalization, he instructed many of New Orleans big chiefs about his funeral. Edward asked Roselyn Smith to make chocolate cake for funeral attendees. He created his own list of speakers for his funeral. He asked that the tune Indian Red be sung during his service and again when the procession was on the street. He wanted lots of Indians and a lot of dancing.